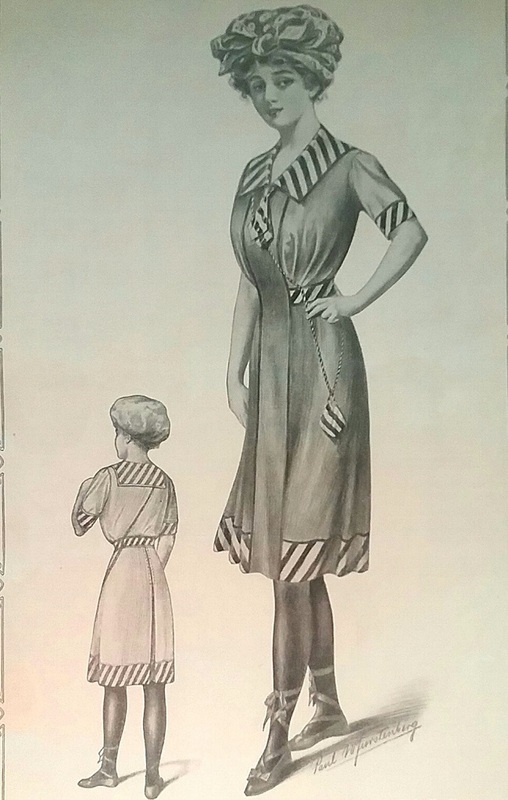 A recent project has been developing a timeline of bathing suits from the 1860s through the 1920s. From looking at the sales pages and such on the internet, it seems to me that such a timeline might be useful to people trying to place a date on older suits. I’ll be adding to what I’ve got here and will eventually make a permanent page on my long neglected Fuzzylizzie.com site. 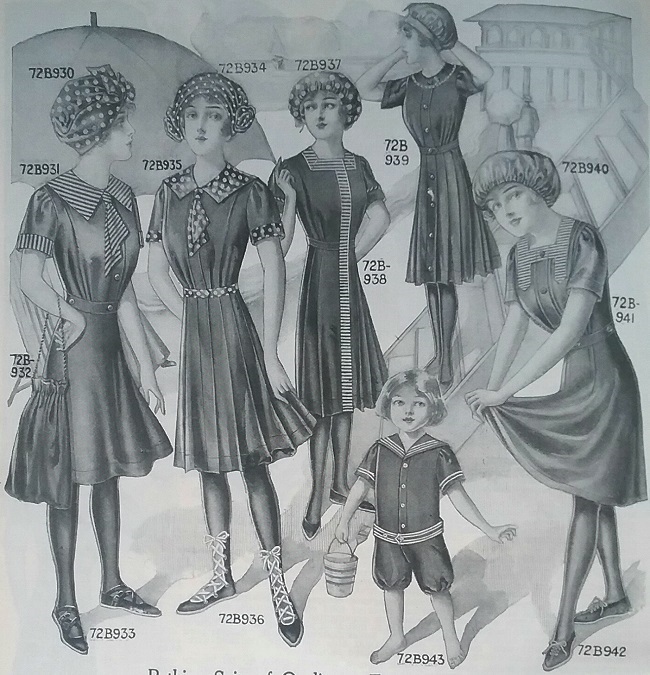 For now, here’s a chronological view of sixty years of bathing suit styles, with date and source, but no commentary. 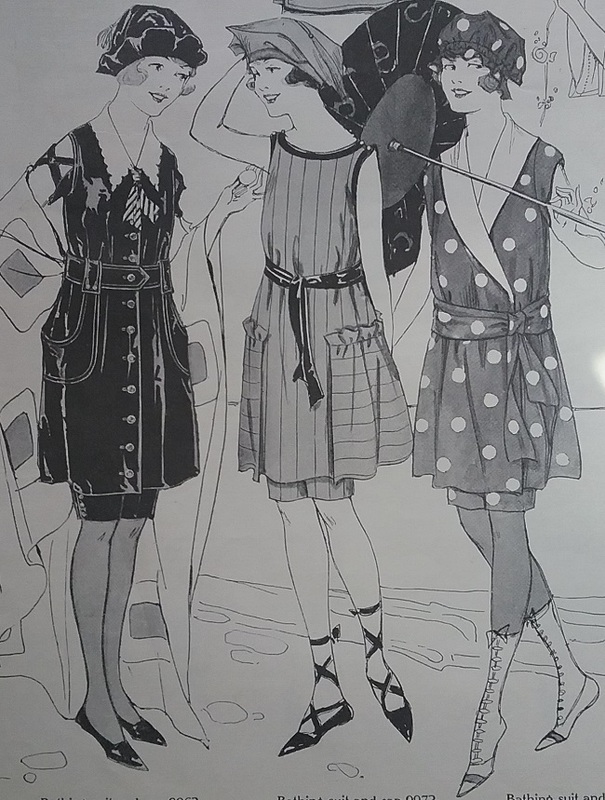 I’ve chosen to end with the mid 1920s, as after that date there are many more resources for dating, and I want to use images that are firmly in the public domain. You can see there are some gaps, and I’m working on at least an example from every five years or so. 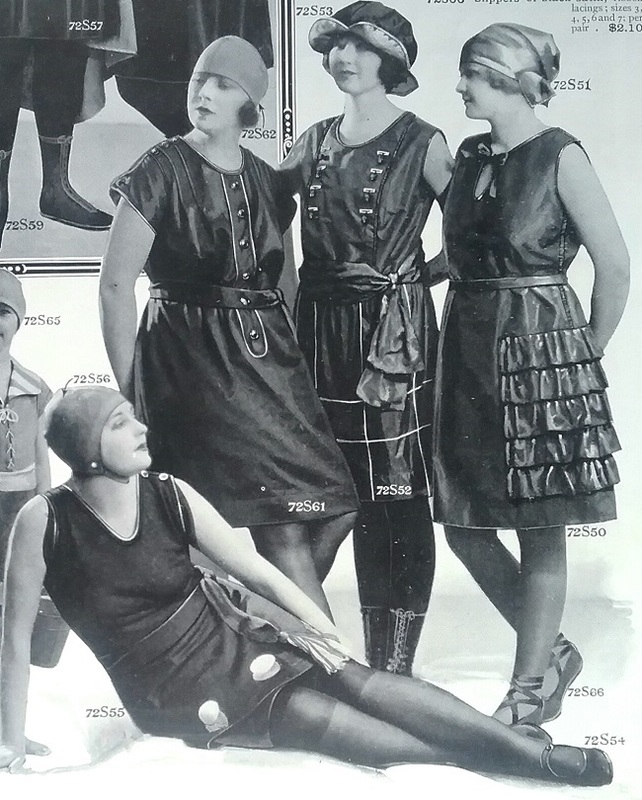 Putting bathing suits in a timeline really shows how fashion was followed, even in the water. I don’t actively seek out sports equipment, but when I run across something interesting or really cheap I’ll pick it up, mainly to use as props if I ever have the opportunity to put some of my collection on display. So I have a few random things like old wooden dumbbells, and a 1940s tennis racket. I have some skates, both ice and roller. But that’s pretty much it. 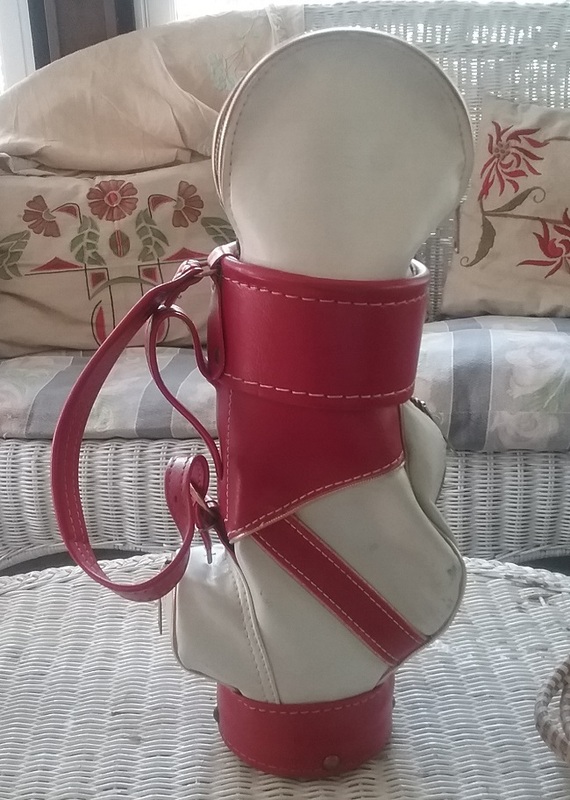 What looks to be a 1960s or 70s golf bag for holding clubs is actually a bag for holding something else, a bottle for the nineteenth hole. There are two more pouches to stash cups or a jar of olives or whatever one’s drink requires. 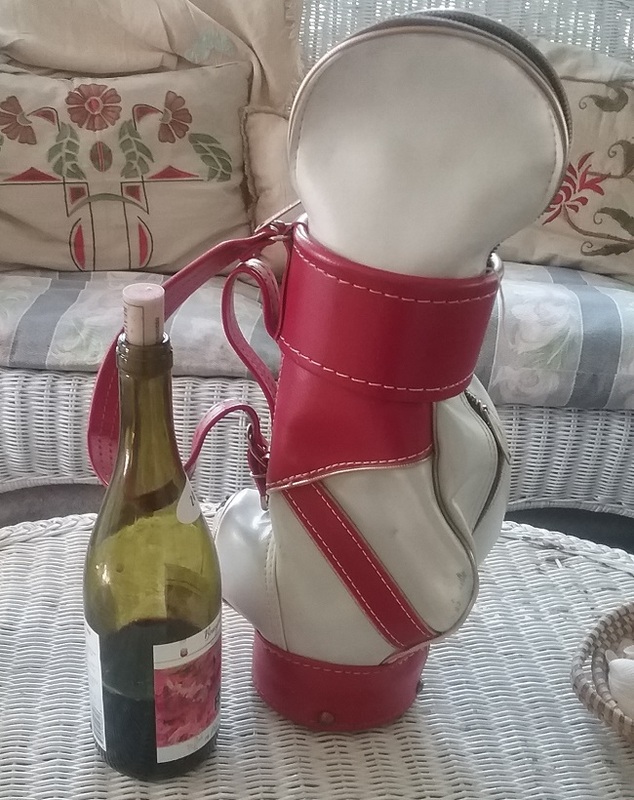 After I spotted this little golf bag on the Instagram of @vtgrunway, I couldn’t get it out of my mind. I realized that I had to add this to my collection, and so I did. To me it seems to be the sort of thing found in special gift catalogs and in magazine sections titled, “What to Buy for the Man Who Has Everything.” Stores like Abercrombie & Fitch carried such novelty items in their Christmas catalogs. I spent the best part of an afternoon trying to locate an example in all my catalogs and magazines, but came up empty. There are no labels at all, but on the interior of the bag is printed the word naugahyde. Naugahyde is often associated with cheap upholstered furniture from the Sixties, but it was also commonly used for tote bags and novelty items. It is a thick vinyl, a product of UniRoyal. 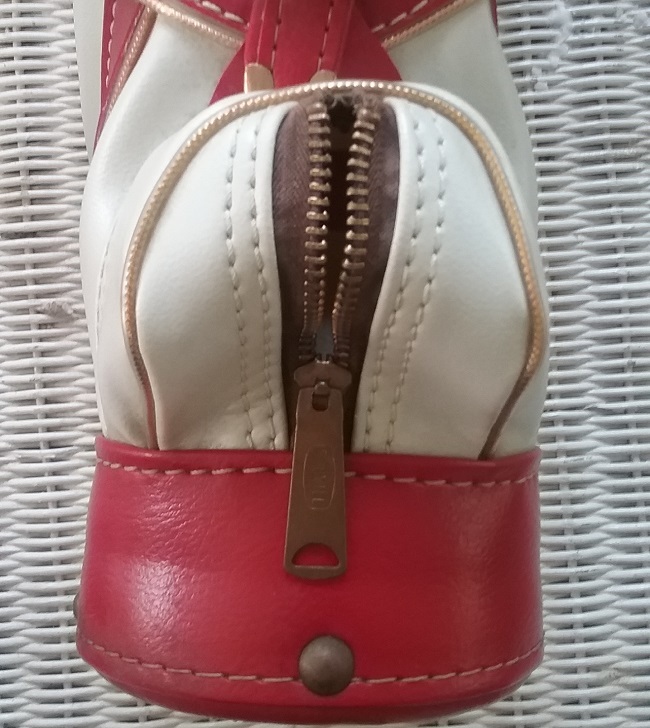 This little pocket is just the right size for a golf ball, or a jigger measure. A larger pocket could hold cups. A trip through the bazaars of the internet show that these are not rare. 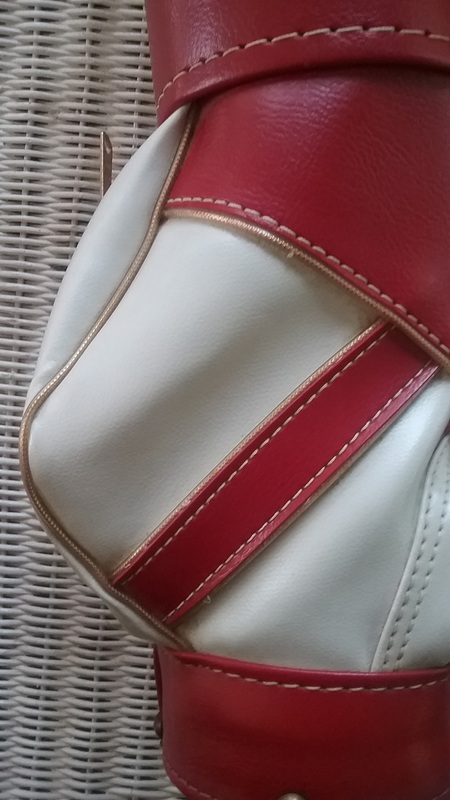 Some I found were stamped with the name of golf equipment, like Wilson, or another brand like Marriot or even Nabisco, They are newer than mine, with nylon zippers (all the zippers on my bag are heavy metal ones) and thin vinyl construction. I feel really lucky to have an older one, probably from the late 1960s. I don’t golf, but my husband does. He was really surprised a few days ago when I told him I wanted to go with him to the course next time he played a round. He’ll play eighteen holes, but I’ll stick with the nineteenth. 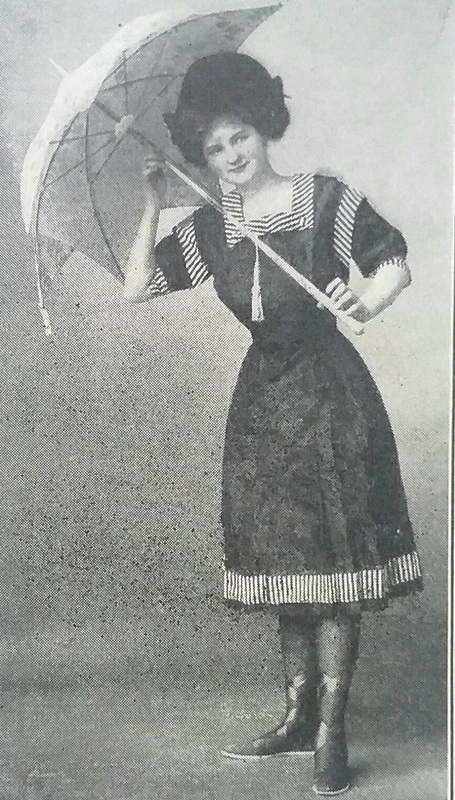 In 1903 women were in the S-bend corset, and skirts still were sweeping the ground. 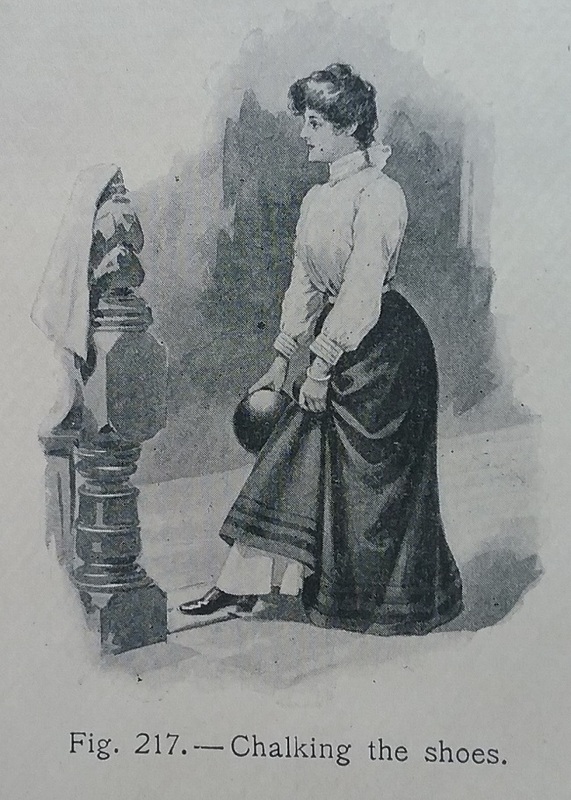 Amelia Bloomer’s great experiment with pants had failed, and even women cyclists had pretty much settled on skirts over bloomers and knickers for cycling. 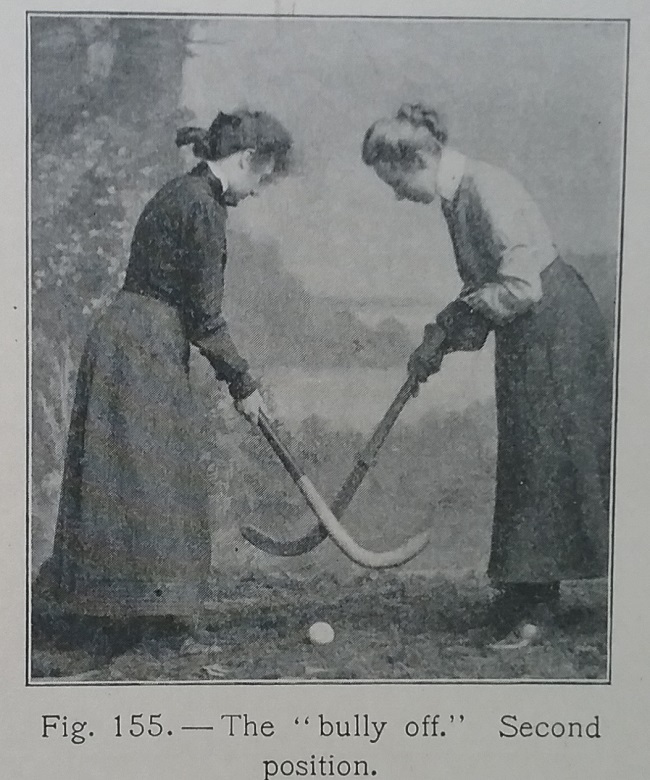 So how were women at the turn of the twentieth century able to comfortably participate in the growing sports boom? Probably the best insight on this issue comes from Patricia Campbell Warner in her 2006 book, When the Girls Came Out to Play. 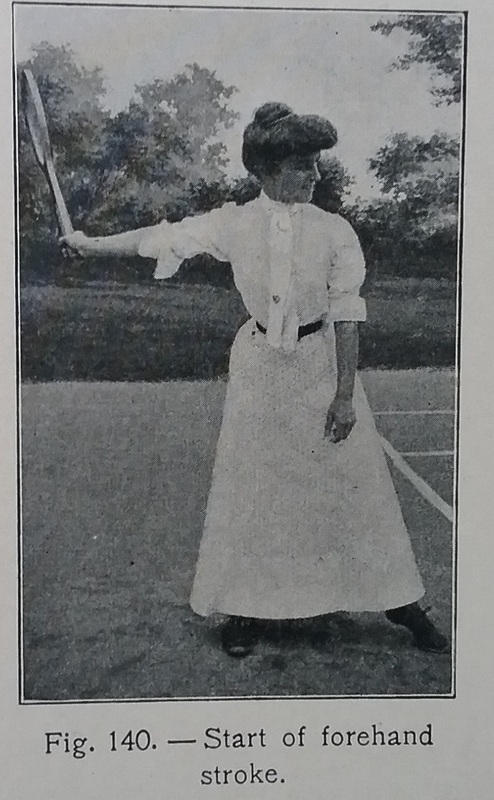 Simply put, women wore skirts when participating in sports in a public (meaning men might be present) way, but they turned to bloomers when the situation was private, or included only women. And there were times when bloomers or knickers were worn, but they were concealed beneath a skirt. 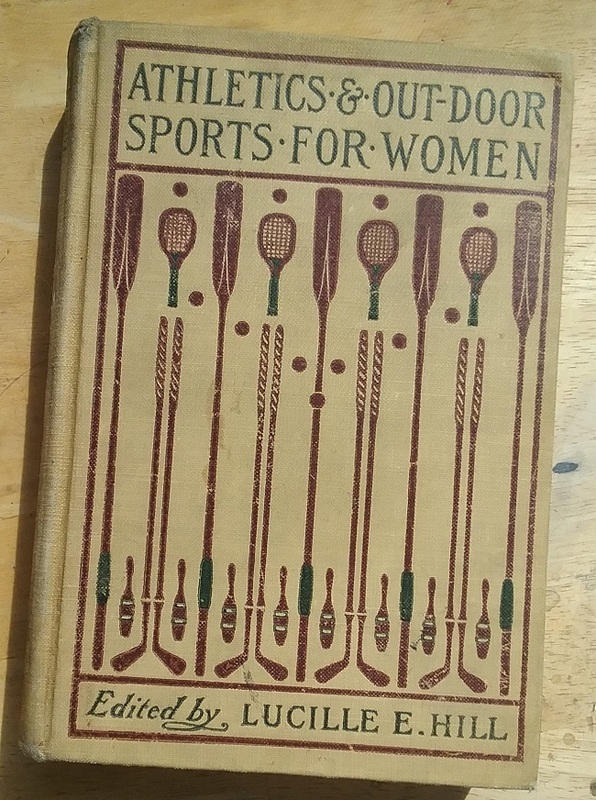 I recently acquired Athletics & Out-door Sports for Women, edited by Lucille E. Hill and published in 1903. 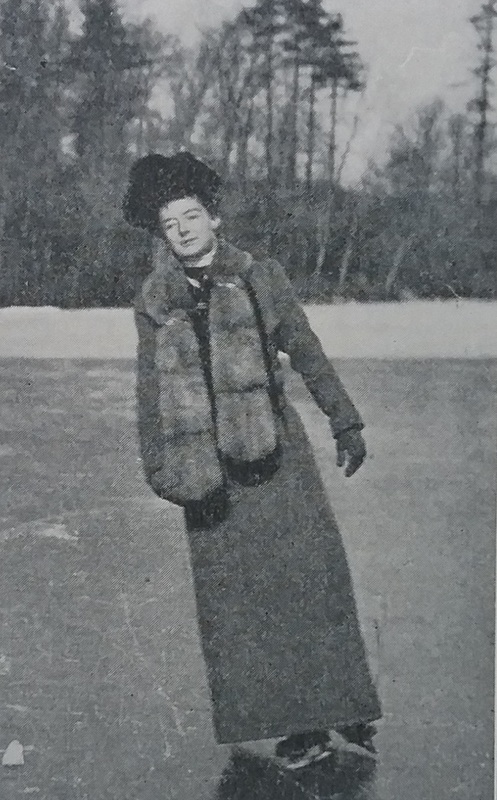 Hill was the director of physical education at Wellesley, and many of the authors of the sixteen chapters were also associated with women’s colleges. Half of the writers were men. 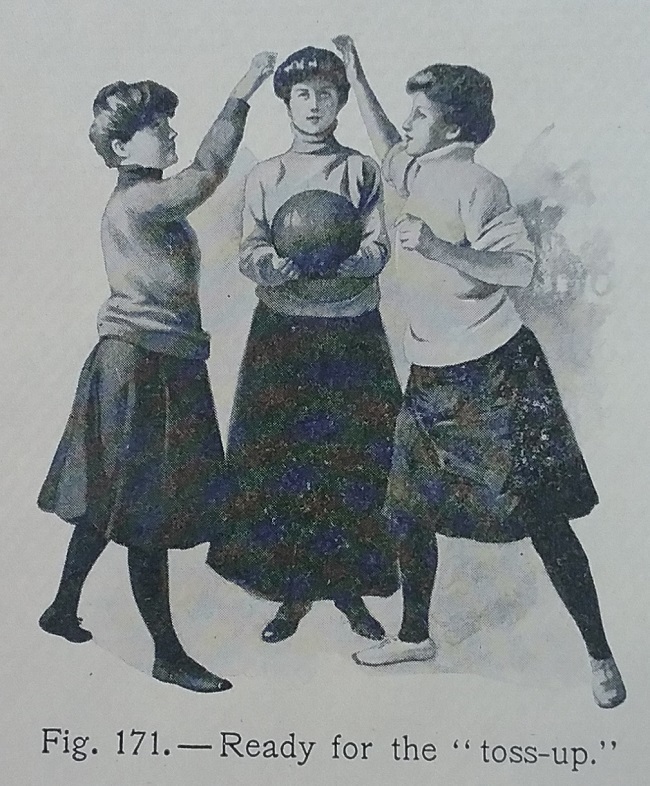 Another book I’ve been reading (well, actually browsing) on sportswomen in the same era was written by women participants in various sports. This might seem like an advantage, but what was produced was a collection of stories praising each individual sport instead of giving the basics of how to participate. In addition, the topics were definitely targeted toward the British upper class: yachting, stag hunting, and riding to the hounds being covered. 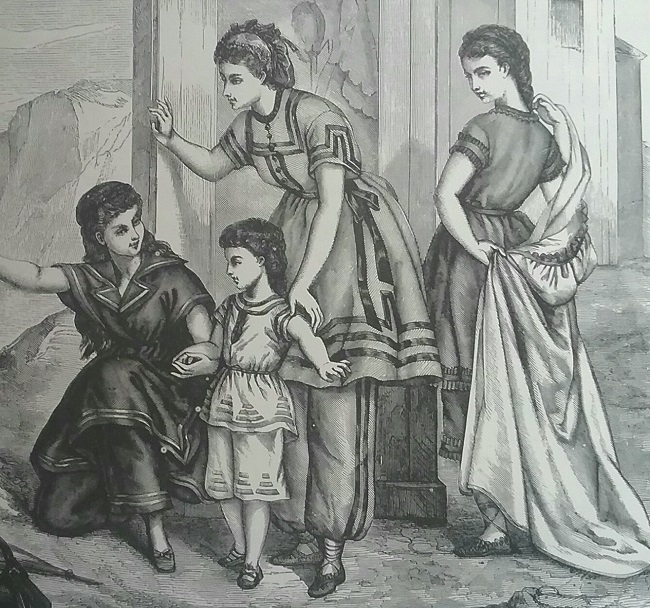 So it has been a real pleasure reading a book that not only is helpful in detailing the clothing women were advised to wear for sports, but also in explaining why, in the customs of the day, such attire was recommended. Not only that, but the photograph illustrations are great. 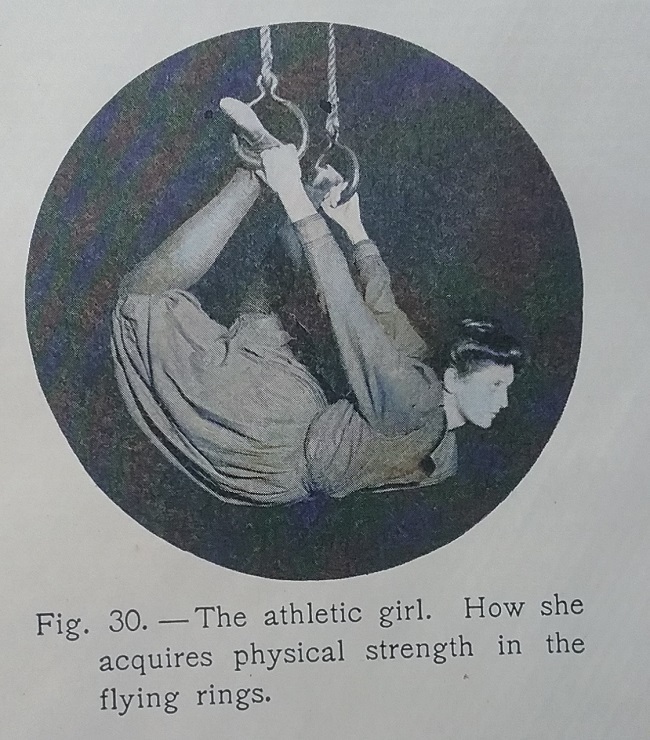 In her introduction, Hill explains that the only real equipment needed for a woman to get “splendid, daily athletic exercise” is a short skirt and a pair of shoes. Remember, this is 1903, and “short” pretty much means several inches from the ground. In a chapter on cross-country walking it is advised that ” Old clothes are best – warm and not too tight. 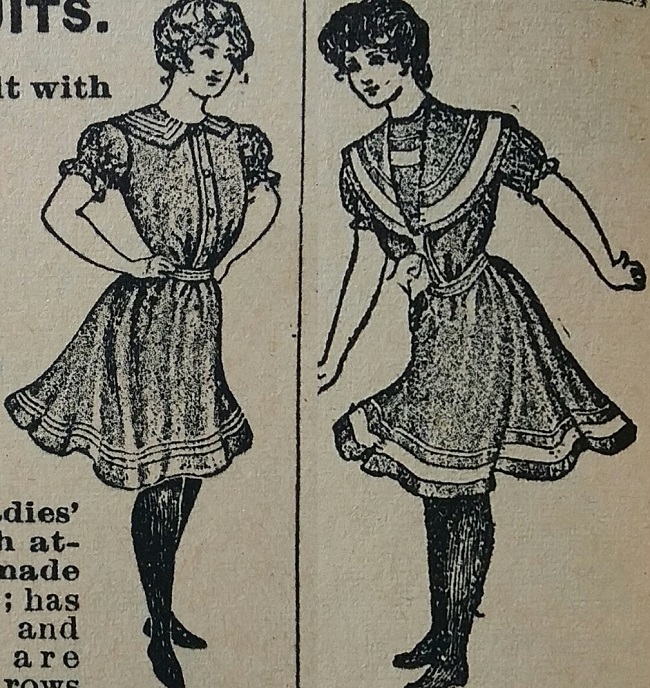 No constriction of any part of the body can be permitted; loose waists, knickerbockers, and short skirts are always advisable.” It may be that the author, a man, was trying to say “No corsets,” but he stopped short at making that pronouncement. He went on to endorse sweaters and woolen underwear, and to abolish pointed toe boots and any heels over half an inch. Ms. Hill explained that before participating in sports, a woman must first build up her strength through training at home or at a gymnasium. And while we are not given a written description of what should be worn, we are told for the only time in the book, that corsets are simply not necessary. If a woman cannot give up her corset for exercise, then it must at least be worn loose. 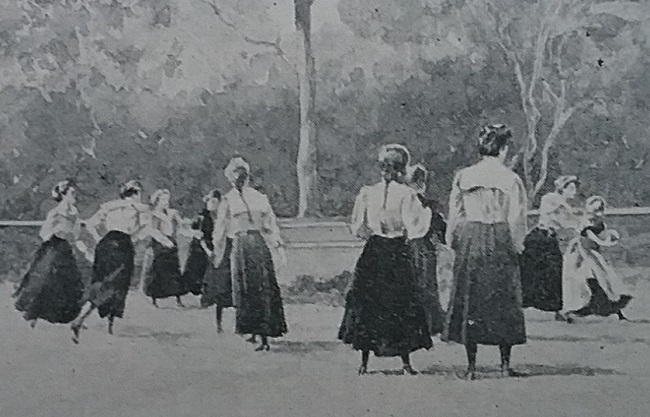 All the photos in this section of the book show the women exercising without corsets. Though the author makes it sound like the skirt and sweater are for reasons of health, I think it is probably a case of not being seen in public in the unseemly bloomers. 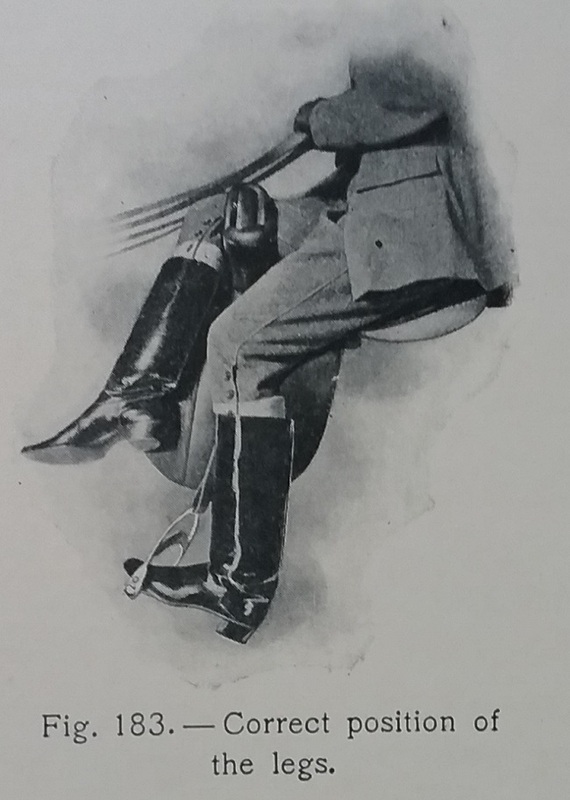 In 1903, it was still standard practice for women to ride side-saddle, and the chapter on riding reflects this attitude. Ms. Beach went on to give very particular instructions for the correct riding habit. 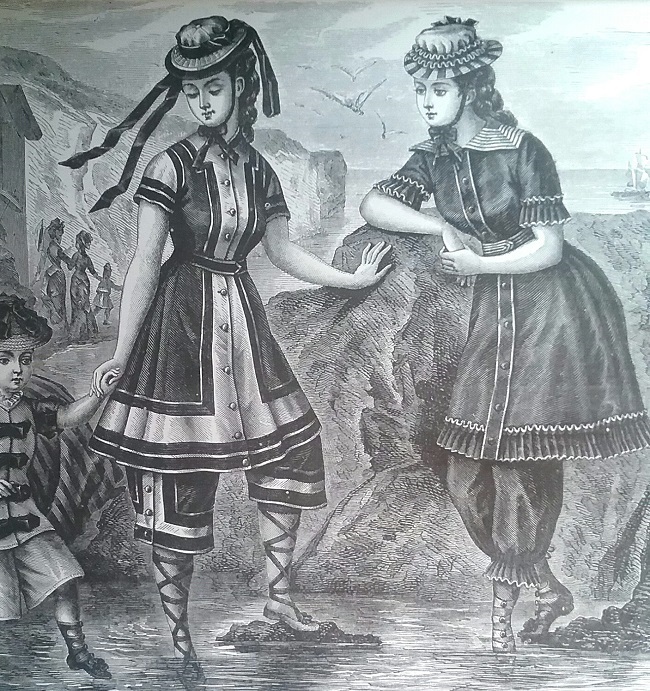 In the illustration you can see the model is in riding breeches, but Ms. Beach made it clear that the breeches are underclothes, to go under a riding skirt. In 1903, most women were not swimmers. 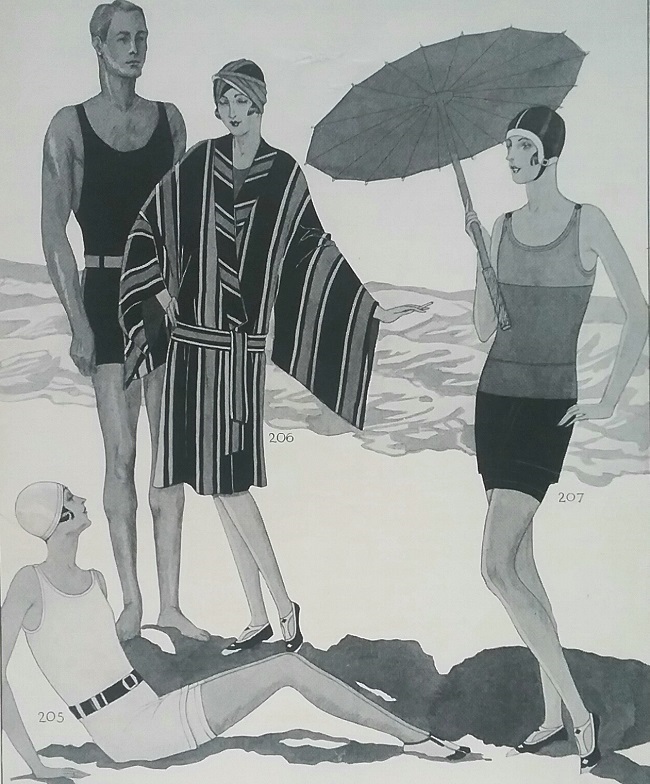 There was a reason it was called a bathing suit, or even a bathing dress. A day at the beach or lake usually meant a mere frolic in the shallow water. But times were changing. 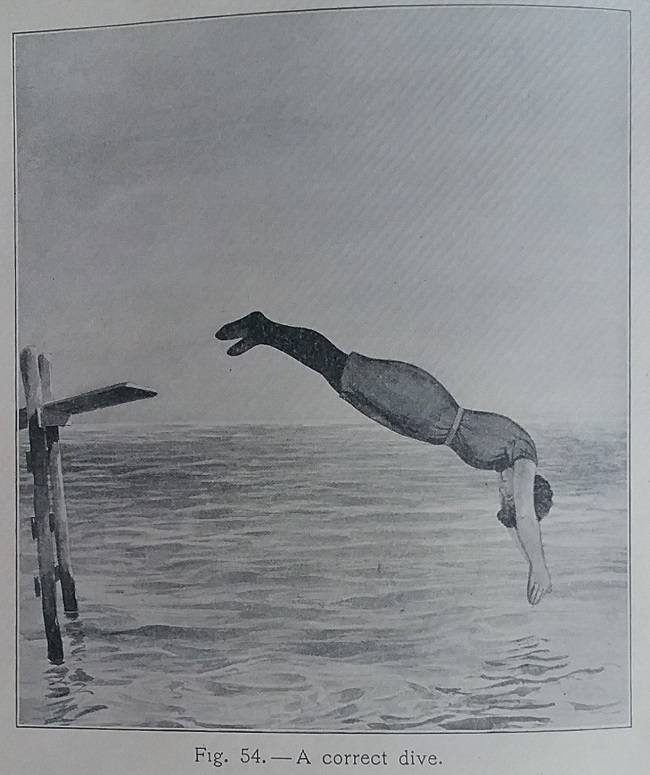 People were beginning to see swimming as a beneficial skill, if not for fun, at least for safety. What Mr. Sandys is actually describing is the standard gymsuit, perhaps with less full bloomers. 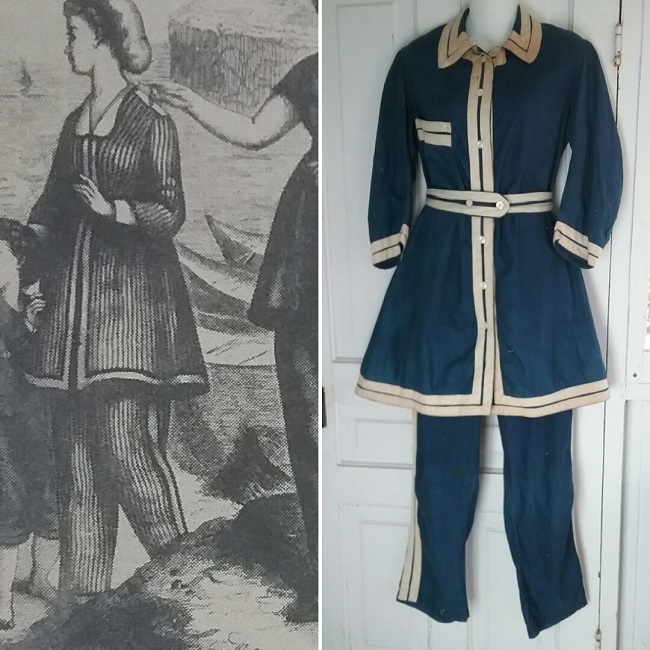 As far as I have been able to determine, the difference between an antique bathing suit and a gymsuit is that in a swimsuit the pants are separate, and in a gymsuit the skirt is separate. I am sure there are exceptions, but this is overwhelming what I see in my own research. If you follow me on Instagram then you have already had an opportunity to ohh and ahh over my new hat. 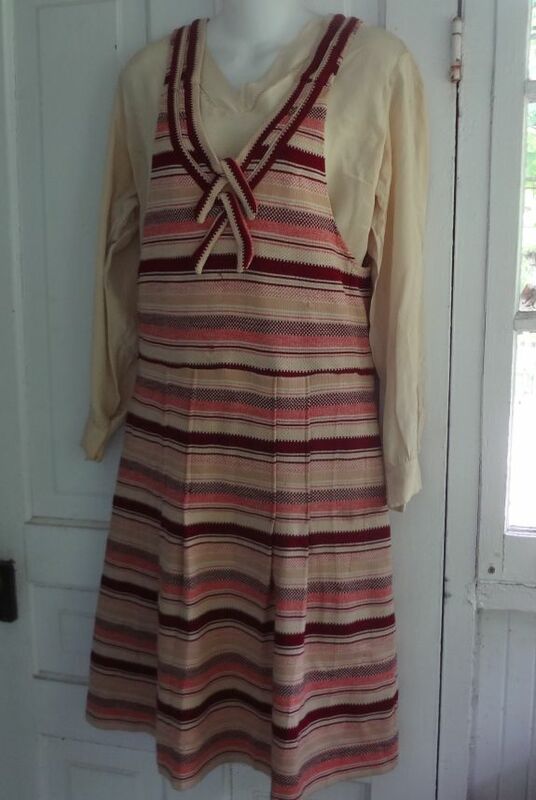 Well, it’s not exactly new, as it dates to between 1928 and 1930, though it has never been worn. 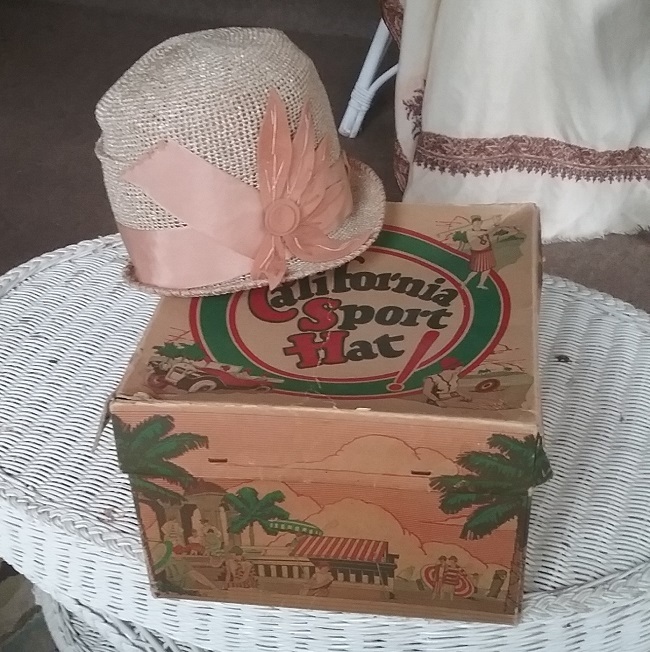 And to make it even better, the original box was included with the hat. You may wonder how such things survive, but as someone who has had the pleasure of visiting several old stores that looked like they had been swallowed up in some time travel vortex, there are treasures like this still to be found. 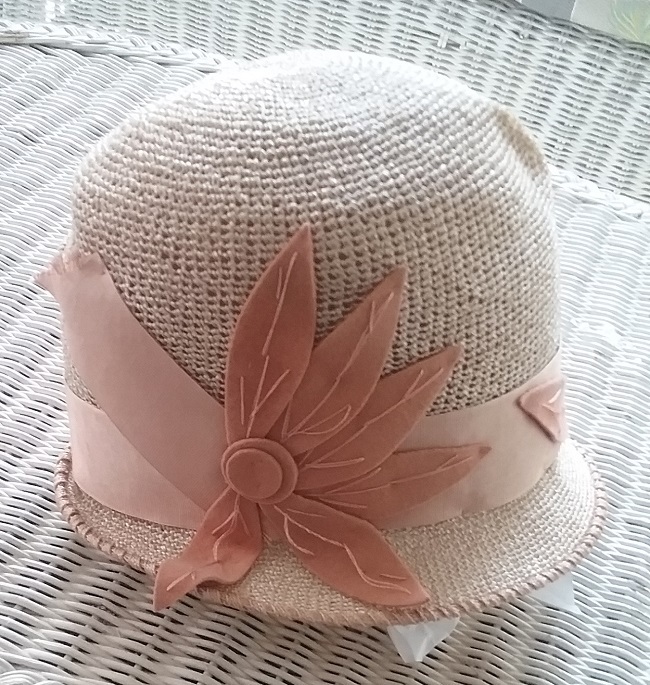 I didn’t find this hat in a dusty old store storage room. It came from Dallas, Texas, from the shop of Vintage Martini. And thanks so much to Jonathan for spotting it and letting me know of its existence. Everyone needs friends who help them shop. 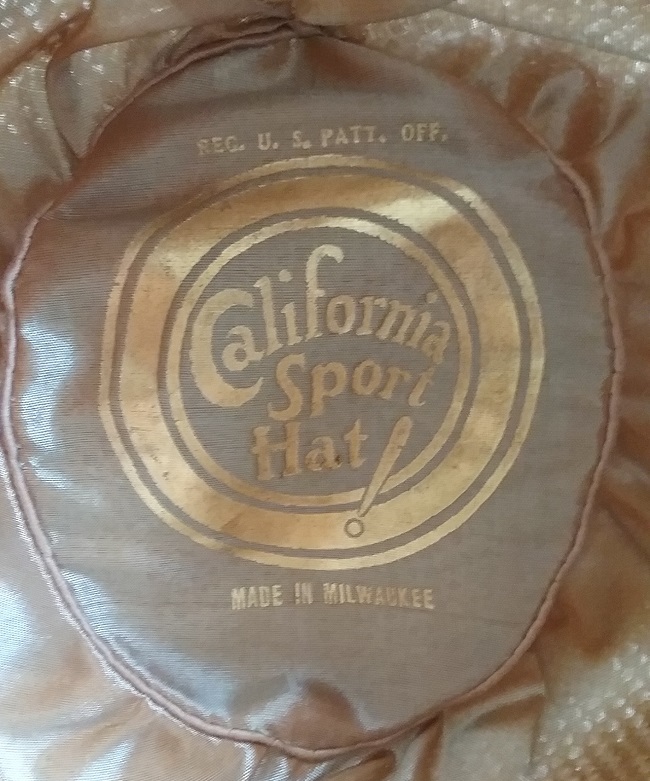 I thought it was rather humorous that at California Sport Hat was made in Milwaukee, so I spent some time googling. At first I got only ads for the brand, all dated from the late 1920s and very early 30s. When I added Milwaukee to the search I got a bunch of links to the Federal Trade Commission Annual Reports of 1930 and 1933. Thanks to Google Books, these reports have been digitized and are available online. I had no idea that government reports could be so interesting. I could barely get past the cases of a maker of cotton shirts who made the consumer think their product was linen and of a men’s hatter who was taking old hats and refurbishing then, and then selling them as new. It seems like cheaters and those willing to stretch the truth to its breaking point have always been with us. So what was the deal with California Sport Hats? There had been a complaint filed in 1929 by makers of hats located in California that the Milwaukee hats were false advertising, and even worse, cutting into their profits. There had been an earlier complaint and in 1928 the makers, Everitt & Graf, Inc., put the “Made in Milwaukee” line in the lining of their hats to try and fend off a lawsuit. Instead, the line pretty much proved the case, and in 1930 the company was issued a cease and desist order from the FTC. Everitt & Graf evidently complied with the order, as in 1932 the FTC closed the case. 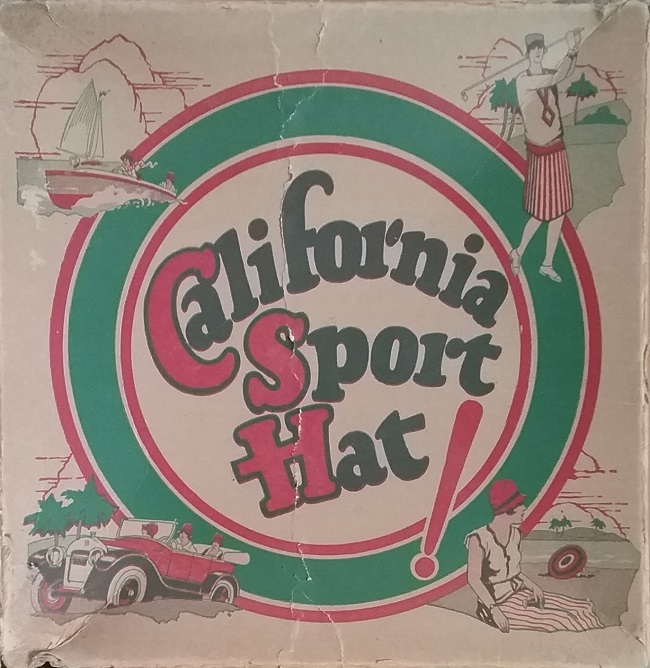 I didn’t find any ads for California Sport Hats after 1930, and I wasn’t able to find out what happened to Everitt and Graf. The “Reg. U.S. Patt. Off.” line is interesting. I could not find any reference to either California Sport Hat or to Everitt & Graf in the Patent Office database. And it’s weird that there are two T’s in that abbreviation. But regardless, what a peachy hat! According to the box, the color is Blush Rose. 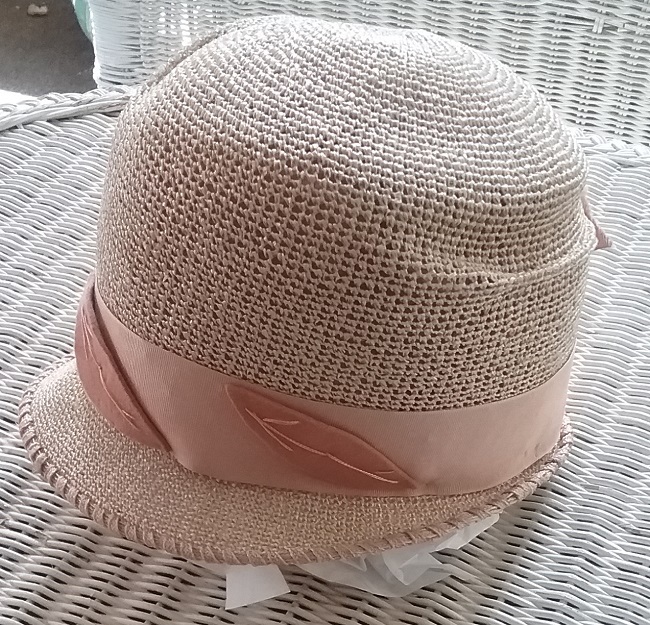 There’s a little turned down brim in the front, and the hat can be worn with a slight tilt. 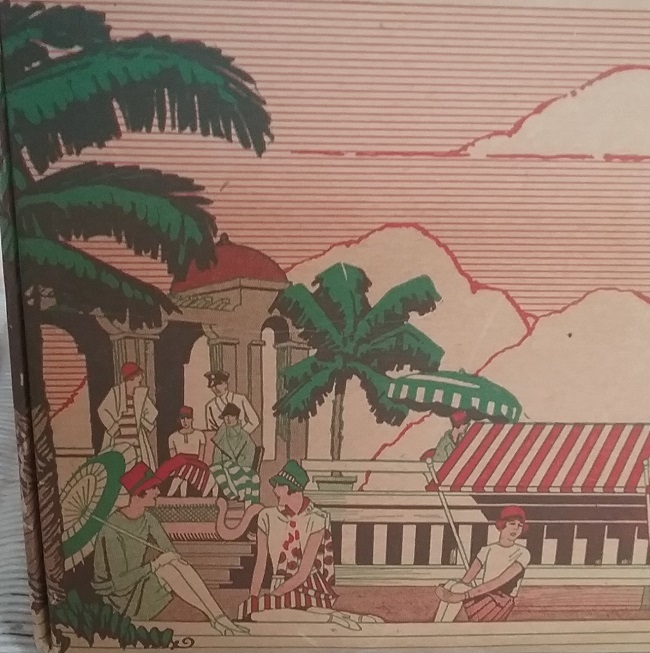 The graphics on the box were used as evidence in the complaint. The illustrations of palm trees, which I’m pretty sure do not grow in Wisconsin, were pointed out as being associated with California, and were meant to deceive. It really is the box that makes this set so special. By the 1920s Americans were benefiting from labor laws that allowed working people to have more leisure hours. And to be clear, this was not a high-end product. The price tag is still present, and so I know this model retailed for $4. Part of the complaint against Everitt & Graf stated that their prices undercut the actual California makers, whose hats started at $5, with most costing much more. 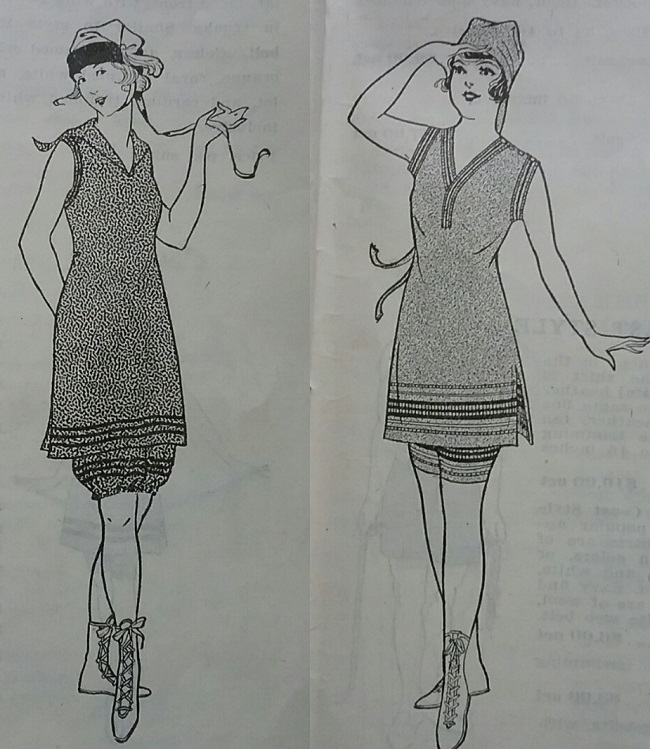 And wouldn’t this hat be perfect paired with this 1920s knit sports dress? 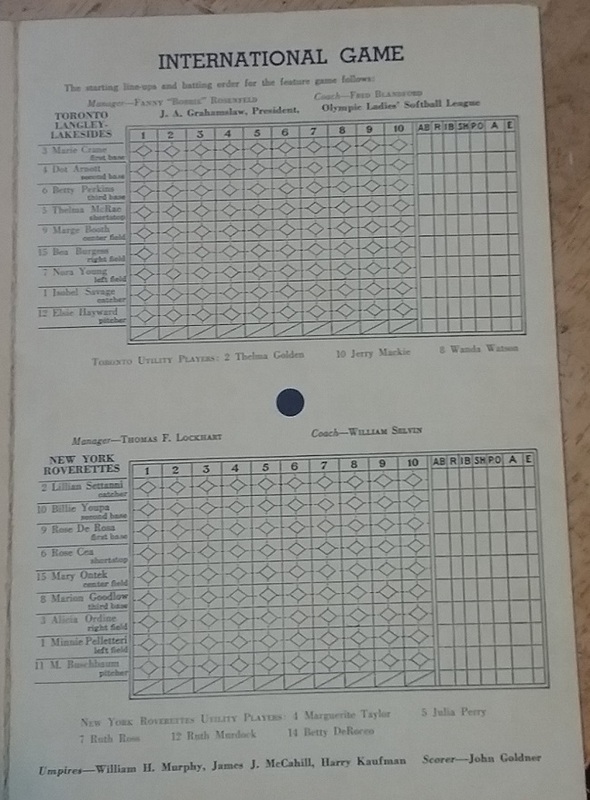 A while ago I found an interesting item at a local antique mall, a 1938 scorecard for women’s softball games at Madison Square Garden. There was a league – the Metropolitan Women’s Softball League, and other leagues across the country as well. Because of the movie, A League of Their Own, the All American Girls Baseball League of the 1940s is well-known, but I’d never heard of a women’s softball league. Growing up, I was well acquainted with fast-pitch softball. Our local YMCA, which was administered by the town’s primary employer, Champion Fiber and Paper, fielded a team, the Champions of Canton. It was a team of men, and I don’t remember there ever being a woman’s team. The Champions were big in Canton. Rumor had it that any excellent ball player could get a job at the paper mill, and I’m sure that’s the way it worked all over the country. Many factories and other businesses had softball teams, and competition for the best players was high. The uniforms were interesting and quite flashy, being made of colorful satin fabric. By the late 1930s most women’s teams had adopted shorts, but some more conservative communities in New England and in Arizona’s Cactus League fielded their women’s teams in long pants. 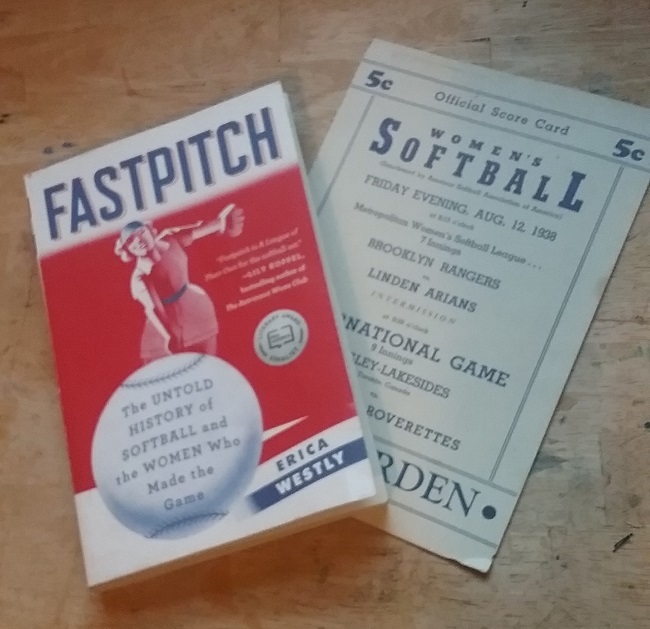 Wanting more information led me to Erica Westly’s book, Fastpitch: The Untold History of Softball and the Women Who Made the Game. Westly tells of how softball started as an indoor sport, but by the 1933 Chicago World’s Fair, it had moved outdoors. It was the 1933 Fair that helped popularize the game. In 1938 it was again played indoors, at Madison Square Garden. 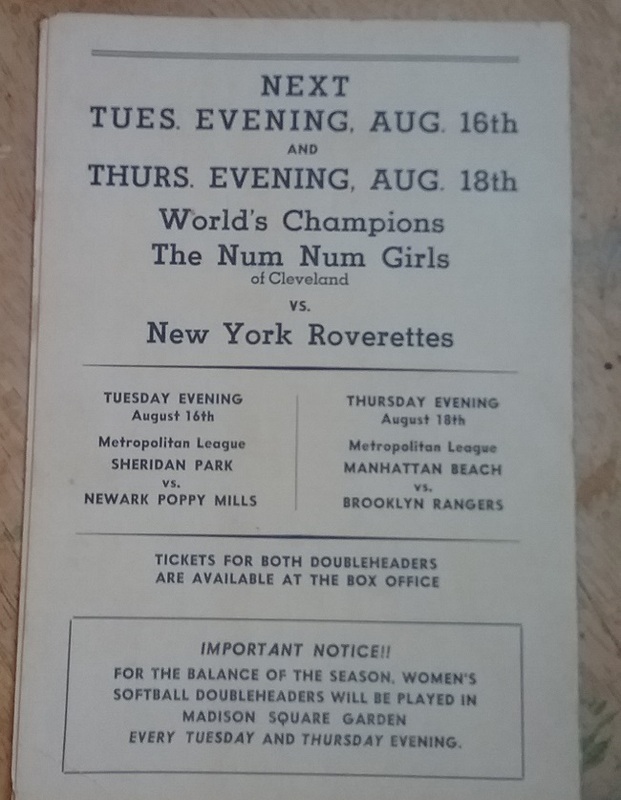 In biweekly games the New York Roverettes would play visiting teams from around the country and Canada. The back of the program gives us a look at the types of businesses that sponsored teams. The Num Num Girls of Cleveland were sponsored by a potato chip maker. The Newark Poppy Mills was a knitting factory. Here’s the scorecard of the International game between the Toronto Langley-Lakesides and the Roverettes. Interesting that all the coaches and managers were men, though that began to change in the 1950s when women were allowed in the management ranks, and for the first time, Black women were allowed on the teams. Fastpitch gives a good look at the origins of The All-American Girls Professional Baseball League. Started in 1943 by Chicago Cubs owner Philip Wrigley in order to keep revenue flowing through Wrigley Field during the war, it was originally a softball league. The name was changed to baseball, and the rules were a mix of both games. 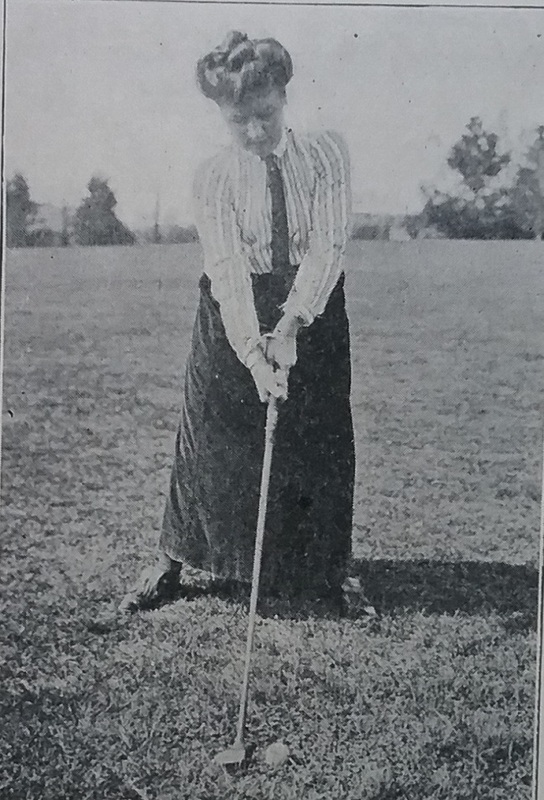 Wrigley came up with the idea of the players wearing skirts with little bloomers beneath. He felt like skirts were more womanly. He also mandated that the players could not wear slacks off the field, and they must always wear makeup and lipstick, and wear high heels when not playing. There were lots of rules, but the pay was good. Many of the best softball players gave up their satin shorts to play in Wrigley’s league. 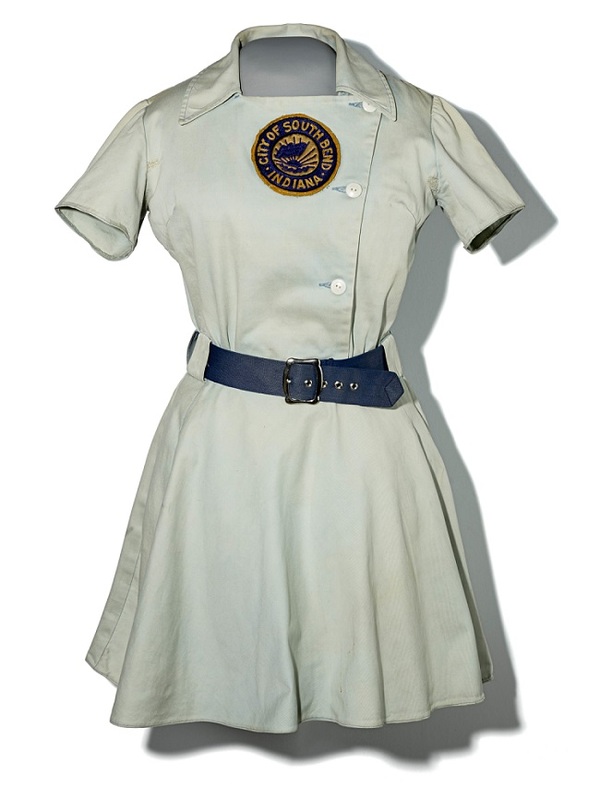 Seeing the Smithsonian’s South Bend Blue Sox baseball dress made me wonder if any of the much more common satin shorts ensembles are in any museum collections. I found a site for the National Softball Hall of Fame which is located in Oklahoma City, but there is little information on the site about the collection. I would bet that there are many located in local historical society collections. Get in touch if you know of one. I bet I’m like most collectors in that I greatly prefer to shop in person, rather than online. With the item right in front of you it is much easier to assess the flaws and feel the textile. But in this world, shopping online is pretty much necessary when looking for rarer items. That’s why I continue to buy stuff I’ve seen only in photos. Most of the time when the item arrives, it is exactly what I expected. The trick is to buy only from those who know their business, and who truthfully describe their items. I’ve found that most professional vintage dealers do these things. I recently bought a few things from an auction house that holds the auctions live with the option to bid online. Before even bidding, I knew that the set above was not as the dealer described it. 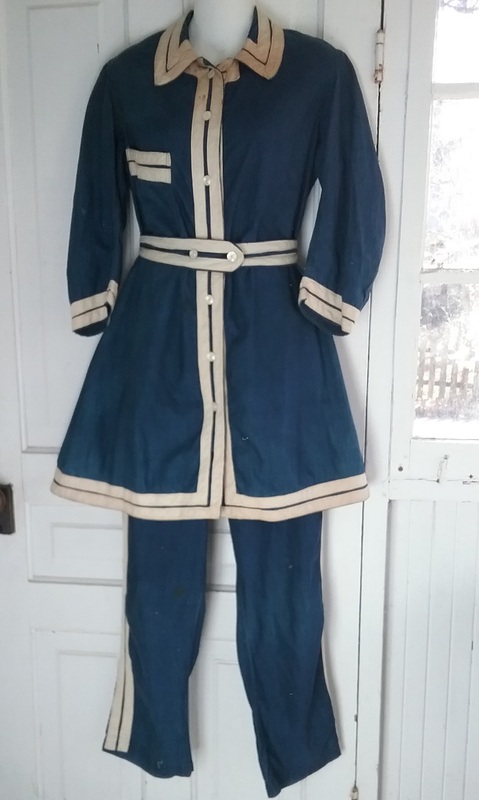 It was listed as a 1900 gym suit. Being made from cotton in in that great indigo blue, I knew this was actually a bathing suit. And from the long pants and sleeves, I knew it was older than 1900. My starting place was to look through all the books I have that picture Victorian clothing. 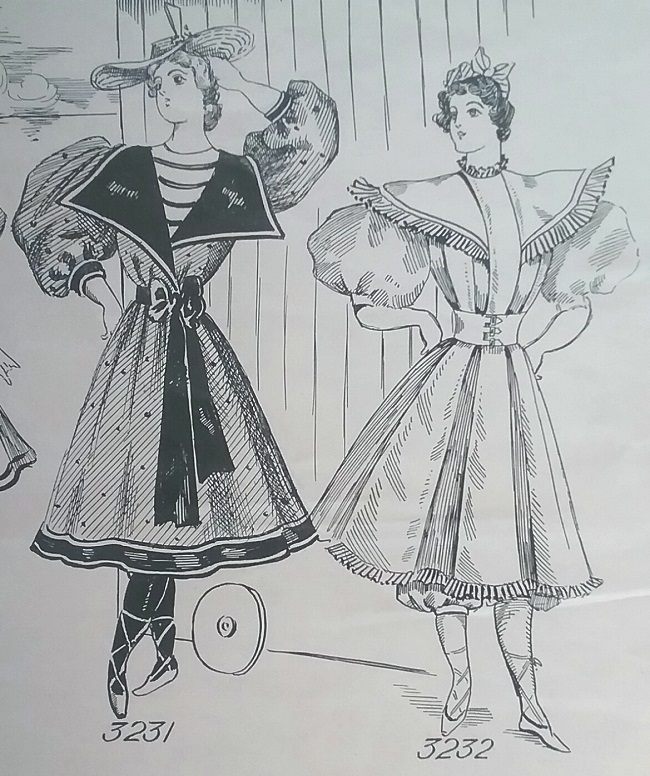 Most useful was a book from Dover, Victorian Fashions and Costumes from Harper’s Bazar – 1867 – 1898. 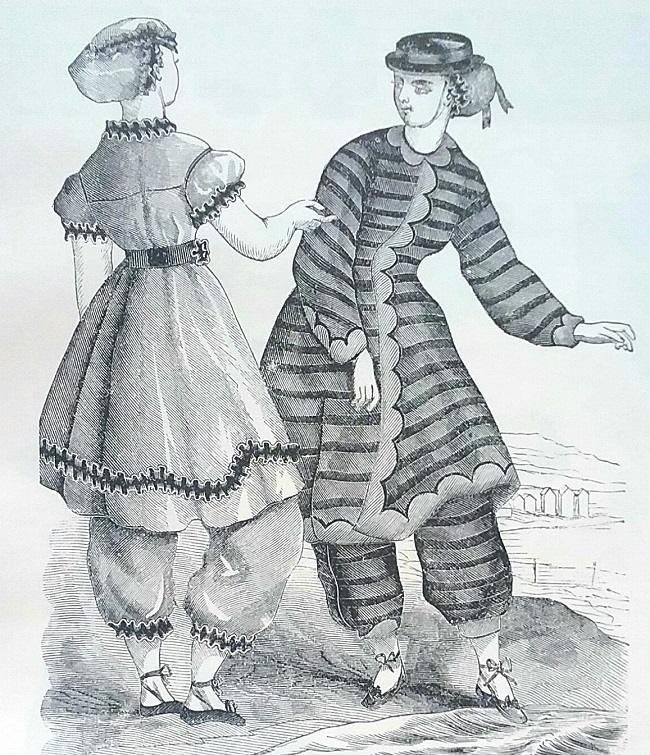 While this book did not have a suit very similar to mine, I quickly saw that long trousers and sleeves were passé by 1876. I then went to the marvelous online resource, Hearth, in which Cornell has digitized women’s magazines, including Harper’s Bazar. 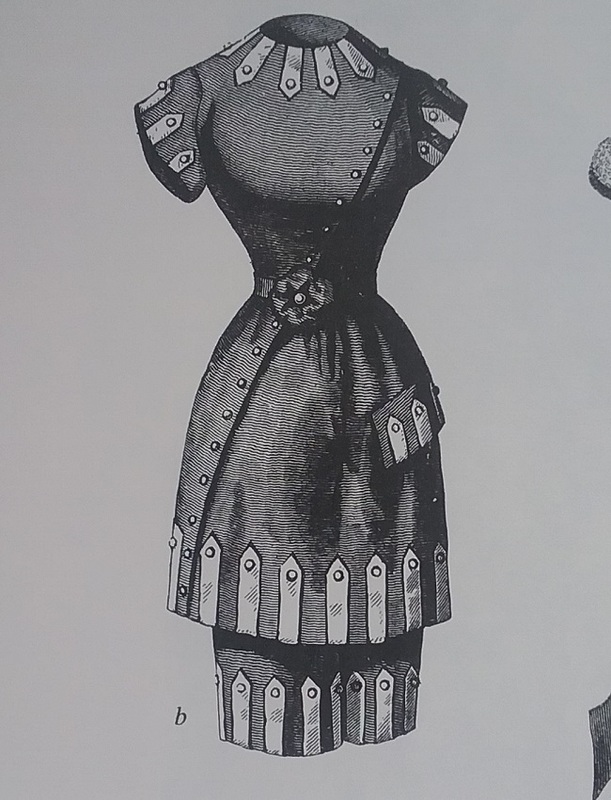 The closest bathing suit I found was the one I’ve paired above, from 1870. That year all the bathing pants were long trousers, but you can see the edge of a short sleeved version. 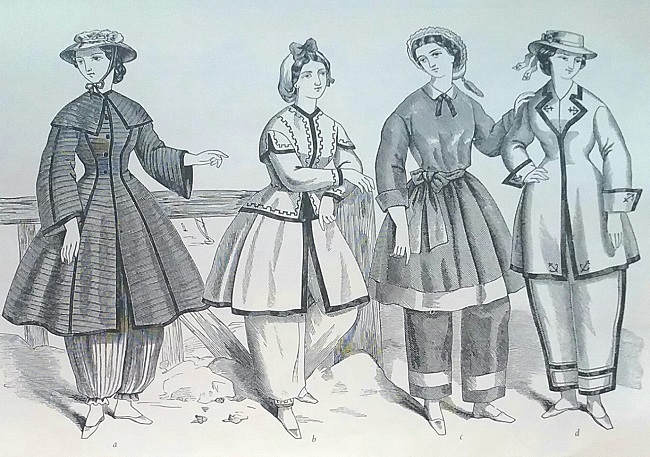 By 1871, all the bathing suits had short sleeves. By 1875 most had pants that came to the middle of the calf. The sleeve continued to shrink so that by 1880 they were just a ruffle at the shoulder, and several years later the suits were sleeveless. The pants continued to shorten as well, to just below the knee. 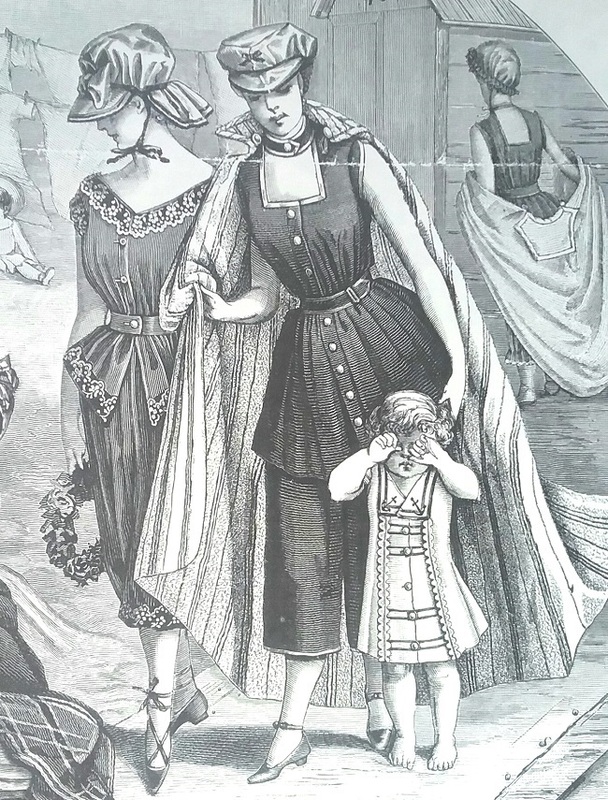 Someone ought to publish just the bathing suit fashion plates from Victorian and Edwardian publications. Put in chronological order, the shrinkage of the bathing suit over the period would become very obvious. What else can I say about this piece? 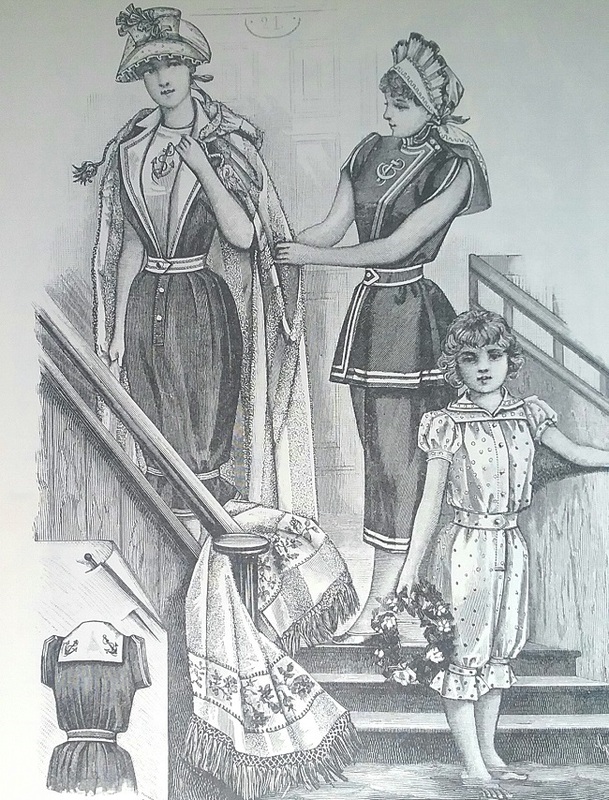 First, it was most likely made at home using a sewing machine, though I have found ads for ready-made bathing suits as early as 1870. The sleeves are made in two pieces, as one might expect with a nineteenth century piece. 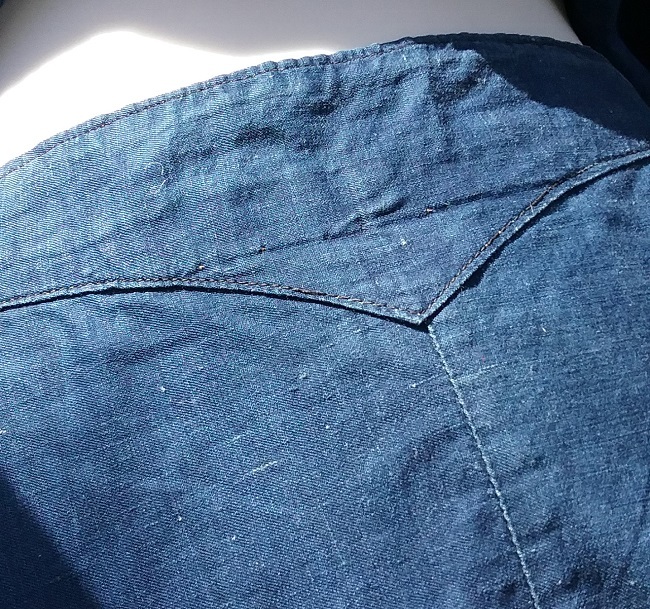 The buttonholes are hand-stitched. The color of thread used is the same as was in the bobbin of the machine – a light brown. If you look carefully at this button, you will detect a problem. This is a plastic button,; a modern replacement. This is an issue commonly seen in items that are this old. The problem is that it was not disclosed in the item description. The other buttons, the ones on the top piece, are glass. Are they original to the piece? I can’t say for sure, but if they are, they have all been resewn with modern thread. But one of them on the pants retains the light brown thread identical to that of the bobbin, which puts in a good word for the rest of the glass buttons. Thoughts? 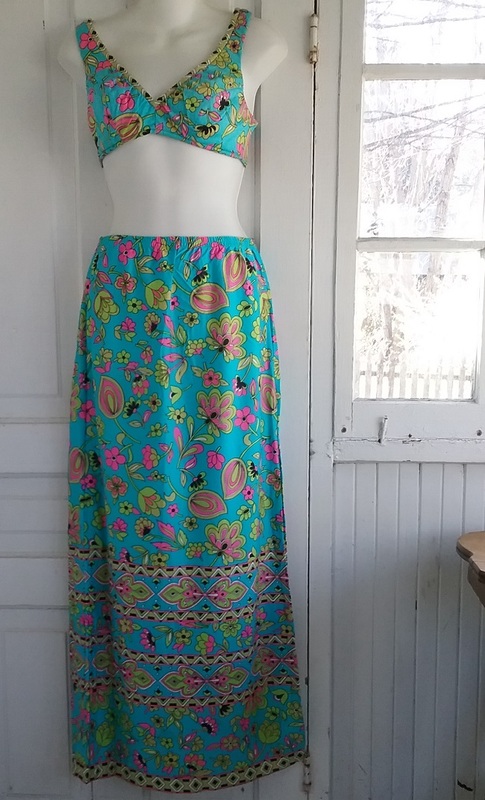 The pants are interesting. The waistband is yoked in exactly the same way as pants from the 1930s. 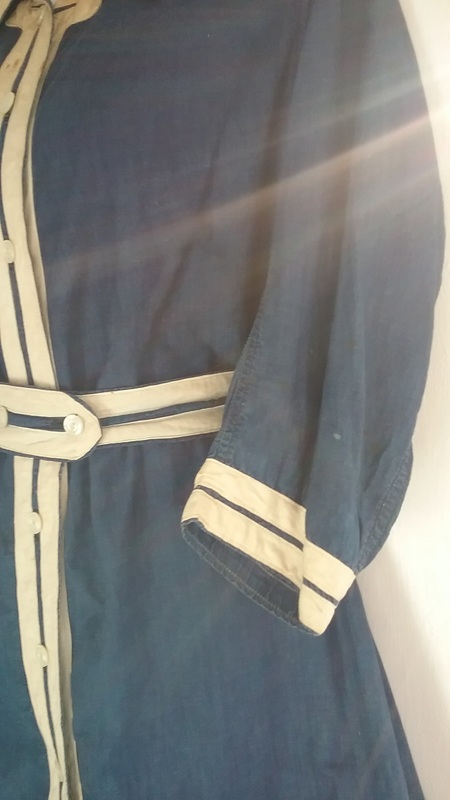 These button on both sides, much like the sailor pants of midshipmen. 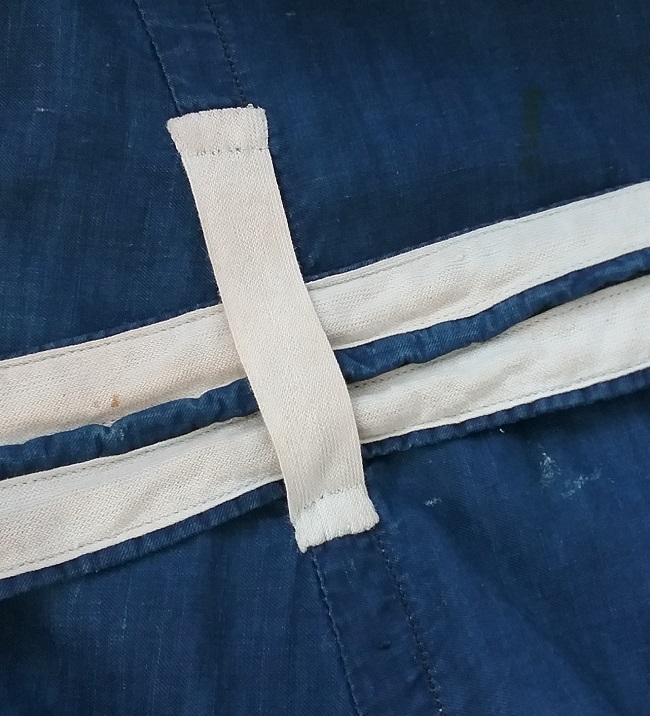 The white trim is a purchased twill, which also forms the belt loops. Overall, I’m pleased with this piece. 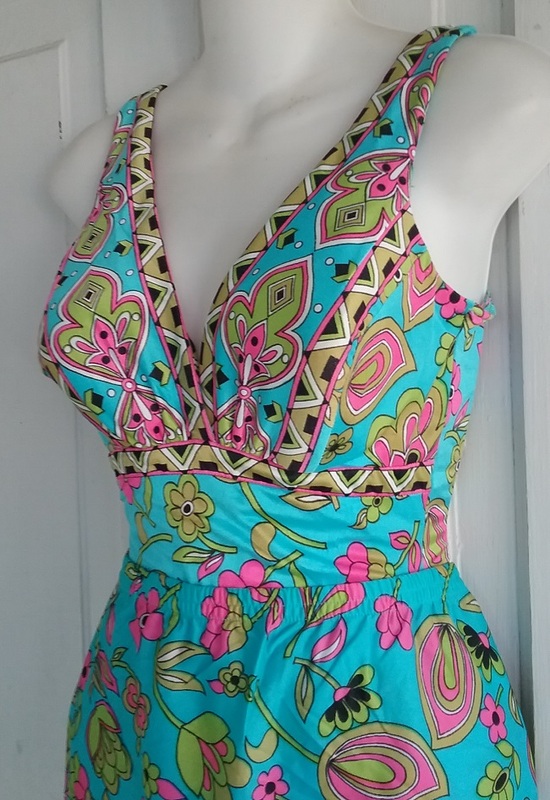 It is a very early bathing suit, the earliest one I’ve ever seen on the market. I do prefer that all parts of an item be original, but a few plastic buttons aren’t worth getting too upset about. 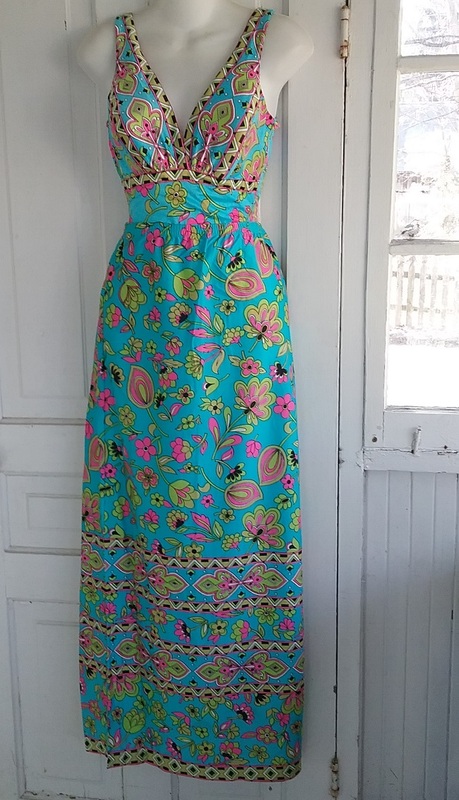 I just wish I had known before bidding.